Since the launch Bold fragrances have gathered way too many consumers and attention. This all is due to their promise to provide spray with more fragrance and no gas or we can say "Gas Free Body Spray". Not just that, they are the pioneers in Pakistan to launch the spray with no gas. Their spray has a high percentage of fragrance compared to competitors which attracts the consumers to give it a try. 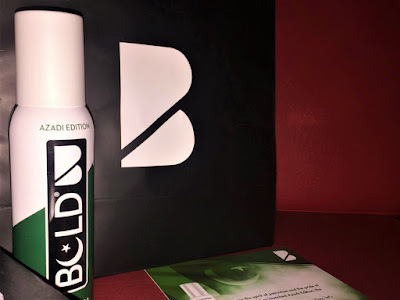 Recently, BOLD launched their limited edition as "BOLD Azadi Edition" in respect to Independence and Defense Day and are calling the fragrance as "Smell of Freedom". Its represents the smell of Freedom and resonates to the spirit of Pakistanis. The spray has at least 3 times more liquid content compared to traditional gas body spray and hence a bottle of Bold lasts much longer than others in the market. Moreover, BOLD's unique gas free formulation makes it a dual purpose product, as it can be applied on both body and clothes. This also eliminates wastage on application. I like this product, i really do. And would suggest if you can give it a try since i believe that you'll end up loving it too. Cheers. For more, check them here.